Mail Online says plans to evacuate diplomats and families are in place, as mob violence spreads. Britain is reportedly "poised' to evacuate its diplomats from the Middle East as mob violence against western targets continues, with an independent anti-Muslim film made in the U.S. serving as pretext for the rioting. According to the Mail Online, "Emergency plans are in place to evacuate UK diplomats and their families." Security has been "reviewed" at British embassies and consulates, and U.S. delegations are on high alert. Canada has temporarily shut down its Cairo embassy. “It is important to note that as these protests are taking place in different countries around the world, responding to the movie, that Friday, tomorrow, has historically been a day when there are protests in the Muslim world,'' Jay Carney, the White House press secretary, told reporters in Colorado. “And we are watching very closely for developments that could lead to more protests. We anticipate that they may continue." Afghan President Hamid Karzai reportedly postponed a planned visit to Norway, because of fear that violence could erupt in his country. In Egypt, the Muslim Brotherhood has called for nationwide protests Friday to denounce the film. 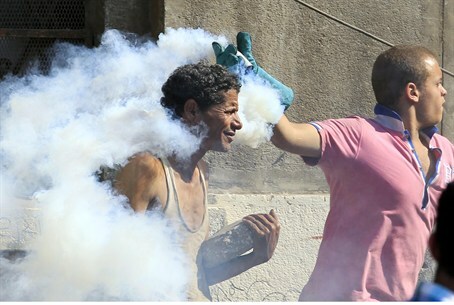 Crowds of youths gathered Friday near Tahrir Square and had begun to throw rocks at police. Worse was expected after the Friday prayers. The unrest started began with the murder Tuesday of U.S. Ambassador to Libya, Chris Stevens, and three other embassy officials. It has spread to Yemen, Iran, Egypt, Pakistan, Afghanistan, Bangladesh, Algeria, Sudan, Morocco and Tunisia. The violence and expressions of hatred are directed at Israel, the United States, and the western world in general. The underlying idea uniting the terrorists and rioters combines religion and geo-politics, and can perhaps be described as that of a war by followers of Mohammed against followers of Moses, be they Jewish or Christian.